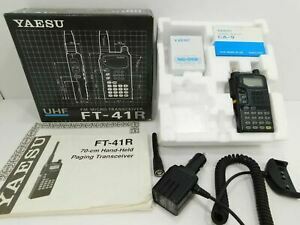 Yaesu FT-41R is similar to the FT-11R, but covers the 440 MHz band instead of 2 meters. Frequency coverage is 430 to 450 MHz. RF power output with the FNB-38 or external DC is: 3.5, 2, 1 or 0.2 watts. Yaesu FT-41R (Handheld UHF Transceiver) specifications, reviews and manuals. Main principle, Superhet, double/triple conversion. Wave bands, Wave Bands given in the notes. Details. Power type and voltage, Storage and/or dry batteries.